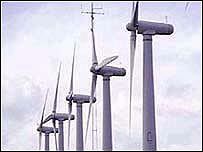 Windfarms are the worst architectural eyesores in Britain, readers of Country Life magazine have declared. Motorways and service stations also rank highly in the poll, which sought nominations on buildings and structures that blight the UK. Second and third on the list are New Street rail station in Birmingham, and Oxfordshire's Didcot Power Station. The majority of readers voted for examples that affected them locally, the magazine said. 3. Oxfordshire's Didcot Power Station. "Some chose buildings they considered to be badly designed and thus insensitive to their surroundings," it said. 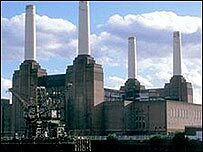 But the magazine expressed surprise at the inclusion in the top 10 of Knightsbridge Barracks, in London. It defended Basil Spence's high-rise structure as a "dramatically modern and uncompromising building". The inclusion of New Street station was more predictable, it said, calling the terminus an "airless and confusing warren housing one of the country's most important rail interchanges". Leading figures with a background in art, architecture and design were asked to show how they might redesign an eyesore of their choice. Janet Street Porter, the Independent on Sunday's editor-at large, chose to demolish the Victoria Shopping Centre in Harrogate. Architect John McAslan took it upon himself to radically redesign Heathrow, which he described as "the world's worst airport". Alan Powers, design historian and architect, recommended a streamlining of the 1950s Bowater House, on London's Hyde Park. Artist Hugh Buchanan suggested Edinburgh University's 1970s Appleton Tower be redesigned as an 18th-century tenement block. And Ptolemy Dean, architect and consultant to BBC Two's Restoration programme, felt passengers disembarking at Ashford station in Kent on the new, high-speed rail line from the Continent should be met with an attractive, low-rise housing development instead of the imposing Charter House Tower. What is the worst eyesore in the UK?